the house stood a medium sized , black, young looking dog. I called him to me and he came into the garage. Since there were no other humans around I closed the garage door to keep him safe. He looked a bit thin and tired so I offered him some food and a blanket. Little did I know that that dog and that moment would change my life in more good ways than I could imagine. I had recently lost a dog and wanted another one desperately but did not have the heart to go looking for one. So I guess one came looking for me. Later that Sunday I took this dog for a walk around the neighborhood to see if anyone knew him. No luck. I posted flyers everywhere and called all the local shelters. No luck. He stayed close by my side, always. So I called him Shadow. Unfortunately, when I wasn’t home, Shadow was busy.I came home one day from work and discovered that the stray dog had destroyed my hot tub cover. The next day he removed all of the landscaping lights and placed them on the lawn. Then there was the aggression issue. He lunged and barked and showed his teeth at everyone we met. I took him to my vet to get checked out and she asked me what I was going to do if I couldn’t find his owner. I said I didn’t know. I lied. He was already mine. So I bought a lot of dog training books and made a lot of mistakes. It didn’t matter. His behavior got better, but it probably wouldn’t have mattered if it had stayed the same. He was mine and I loved him. He was a great comfort to me when my Mom was dying. His quirky behavior opened doors to new experiences and new friendships I cherish. My life would have been much different if Shadow hadn’t found me. He has been by my side for 14 years. Our walks are slower now, and I still cherish every moment with him. In Loving Memory September 28, 2013. I’ve always been interested in dog behavior, but the introduction of Shadow in my life brought new urgency into my learning curve. Because of him I learned how you can help dogs reach their full potential, and how we can help owners accept and improve the animals in their lives. 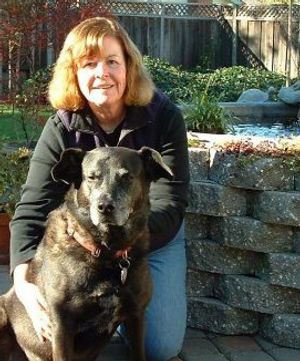 I volunteered at ARF for 4 years, took both levels of the Marin Humane Society’s Canine Behavior Academy, and interned with Trish King, the Director of Behavior & Training there for two years working with a variety of shelter dogs and their behaviors. My goal is to enrich the lives of both dogs and their humans in a positive and fun way.